Traditionally, buying a mattress would be a long drawn out process of having to physically go from showroom to showroom, testing out different mattresses while being swarmed by sales staff. Like most industries, the mattress buying industry is undergoing a significant shift in culture with the formation of several online-only manufacturers who pride themselves in quality and service, while passing on the savings to the consumer. 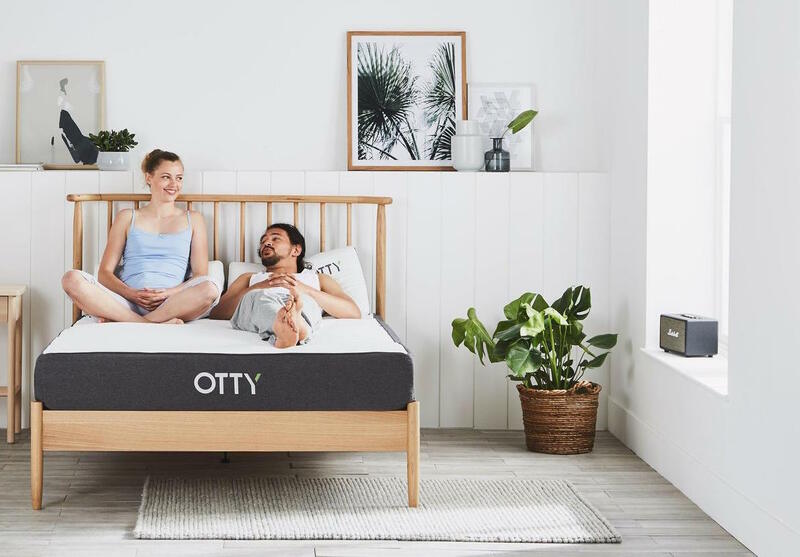 OTTY is one of these emerging mattress brands which is quickly establishing themselves as a household brand, but just how good is the mattress when it comes to performance? Well, we’ve created this guide to show you both the benefits and the negatives to allow you to make a more informed final buying decision. if you'd prefer to choose between our favourite picks, click here. 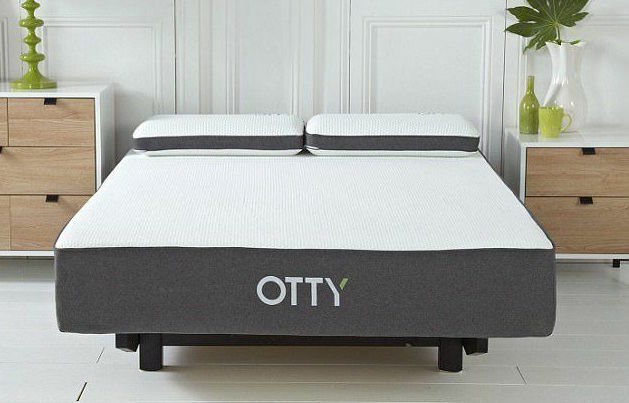 The OTTY brand has been formed to fill a need of creating a mattress that provides a balanced, good nights rest to leave you refreshed when you wake up making you ready to attack your day with vigour and zest. Instead of creating many different mattresses, OTTY has made the buying process easy by creating a single mattress to suit all body types and shapes. To be able to achieve this, the OTTY mattress has undergone gone numerous tests to ensure that it is suitable for all types of people to create a truly one size fits all solution. The mattress has been designed and engineered within the UK by real experts to produce products that are built to last for years without failure. Nothing has been overlooked in the construction of the OTTY mattress which consists of four layers which work together to give you the most comfortable sleep. This layer uses pin core technology which allows air to circulate through the layer easily resulting in a cooler nights sleep. It also helps to regulate your body temperature helping you to sleep through the night uninterrupted. This is where the mattress performs. This 3cm thick layer features luxurious memory foam which contours to the shape of your body in response to any position you sleep in to provide support to your vulnerable body parts such as your spine. This helps to relieve pressure, so you wake up feeling refreshed. This 14cm thick layer features 2000 encapsulated pocket springs. This number has not been chosen by chance but is the result of testing the optimal spring number for a good nights sleep. These 2000 pocket springs provide cradling support while also increasing your sleeping area by up to 25% while limiting motion transfer. To round of the mattress, it has a 5cm thick high-density foam base to provide a sturdy base to provide support to the surrounding layers. 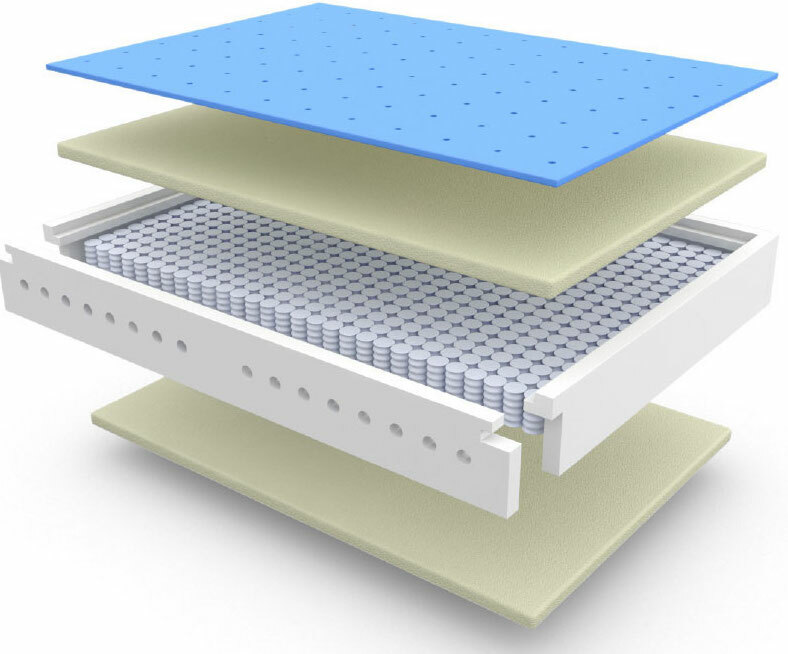 The mattress is finished off with a high-quality 500g premium knit quilted top cover which has a unique soft touch feel while also being breathable which works in synergy with the cool blue gel in the mattress leading to optimal air flow. This cover is also removable and suitable for washing machine cleaning. The great thing about OTTY is that you can purchase from the comfort of your own home all online. So, within 5 minutes and just a few clicks of your mouse, you can have a brand new mattress on its way to you. You have the choice of paying the cost up front, or OTTY provides affordable finance solution which makes the price more manageable. If you have any questions along the way, the OTTY team can be reached via email, social media, phone or via the live chat function on the website so you can always be connected to the company in some form. Although there is one flagship product, it comes in a variety of sizes to suit your needs including single, small double, double, Kingsize and super kingsize. Gone are the days of having to pull a full-sized mattress up a flight of stairs in your house. The OTTY mattress is delivered compressed in a box roughly measuring 150 x 45 x 45 cm which makes it much easier to move into your desired room. Once you have unpacked the mattress from the box, it will require a minimum of 4 hours to rise into its correct shape. It's recommended that you unpack it as soon as you receive it, then it should be ready to sleep on by the evening. It can take up to 24 hours to fully expand and rise out. The OTTY mattress feels balanced when you lie on it providing a firm yet soft feel. Although it’s not specifically an orthopaedic mattress, you can still feel the layers providing a high level of support on your spine and body to comfort the natural curvature of the spine giving you a better nights sleep. Numerous customers have reported that the mattress has improved any previous back or joint issues that they were previously suffering from. One thing that disappears when you begin to use this mattress is waking up in the middle of the night sweating which is ideal if you naturally get hot during your sleep. You can feel the cool gel technology working to regulate the temperature of your body. Because your sleep is being disturbed less, you can feel the effects of this in the morning when you wake up feeling refreshed and energised. In comparison to other internet mattress companies, this is slightly firmer giving more support. Surprisingly this mattress provides strong support whether you naturally sleep on your back, side or front while not providing too much sinkage to keep your spine aligned. The support is maintained across the full area of the mattress, not just the middle, which is especially important if you share a bed with another person. The springs come into its own as it distributes your body weight evenly other the mattress. On a firmness scale of one to ten, we would rate this a 7.5-8. It doesn’t feel rock solid, but you can feel its support which then allows you to fully relax your muscles and get the proper rest you need. This is noticeable after the first few nights that you use the mattress because you often don’t realise that you’re getting poor quality sleep until you change your mattress. The OTTY mattress is compatible with a large range of base types. In reality, any solid frame will be suitable including box spring, divan bases, traditional frames, adjustable based or directly on the floor. The mattress is compatible with any flat surface, giving you the versatility and saving you money as it can just take the place of your existing mattress without having to make additional purchases. OTTY offer a ten-year warranty with all purchases of their mattresses. This gives you added peace of mind that you’re purchasing a high-quality product and shows that they back their product. They recommend that you change your mattress every eight years, but the warranty covers a full ten years from the date of purchase to protect you against any potential defects that may develop with the product. Because of the mattresses built in weight distributing technology, it is perfect for use for two people who weight up to 18 stone each or a total of 36 stones. It's often common for mattresses to need to be turned every so often. Because the OTTY mattress is designed with the Cool Blue Gel layer on top, this has been positioned in this way to provide maximum comfort for the best nights sleep. Because of this, it should not be turned, and the construction of the mattress means that its shape will not be distorted even over a long period. The mattress is very easy to clean because of its included mattress cover. This cover can be easily removed and washed in a washing machine. This cover protects the actual mattress from damage whether it's food, hot drink or general everyday dirt and dust. Despite being relatively new to the market, OTTY has racked up a significant number of reviews with a vast majority being positive. It shows that a large percentage of users are happy with the product and it works very well. The in-built 4 layer system provides you with excellent posture support while also regulating your body temperate to prevent you from overheating. These layers work in synergy to both ease and avoid any back issues. It's difficult to imagine using a mattress without memory foam because of the quality of sleep it offers. A mattress of this level could easily be priced at £999, but prices start at just £399 which provides you with unbeatable value especially when you consider the ten-year warranty you’re essentially getting a mattress for £39.99 per year. When you factor in the fact that you’ll be getting a better sleeping experience, this is a great price. This price is possible because they make huge savings by not having physical retail stores, and they can pass these savings onto you the customer with a more affordable mattress. The mattress is designed and manufactured within the UK giving you the chance to support a genuinely home-grown company. It also benefits you in terms of support as if you ever have any issues you can call a UK number and speak to a mattress specialist about your concerns or problems. All OTTY products are hypo-allergenic which makes them suitable for anybody who suffers from skin or dust allergies. So even if you have sensitive skin, then this mattress will be ideal for your needs. OTTY have followed several other leading internet-based mattress companies by offering a 100 night trial period. It’s common that it can take up to a month to get used to a new mattress, so there’s no rush with this mattress to see if it suits you. If after the 100 nights, you decide that it’s doesn’t suit you then you can arrange for it to be collected and you will receive a full refund. This allows you to test the mattress without making a full purchase commitment. If this is the first time you’ve had a memory foam mattress, then the initial smell may be a little odd. When you first open the box you will smell a slight odour, which is typical for memory foam; however, this smell disappears within a day or two. But it's recommended that you keep the windows open or place it in a room that has proper ventilation. OTTY are relative newcomers to the mattress industry which can be seen as a positive or a negative. However, it must be noted that they are focused on providing excellent customer service and support, while it has received a considerable number of positive reviews that show they are truly delivering a top class product. The 100-night sleep trial and ten-year warranty should relieve you of any worries about the brand. Although OTTY is a relative newcomer into the “mattress in a box” companies, they are quickly establishing themselves because of their affordable price with their effective product. This mattress is ideal if you’re looking for a supportive, comfortable mattress provided by a UK based company that will offer you all the support you need along the way. With its 100-night sleep trial and ten-year warranty, it’s almost a risk-free purchase, and you can take your time and test it to make sure it’s right for you. 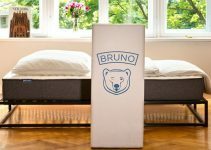 While being value for money, you can see that mattress buying no longer needs to be a hugely expensive drawn-out process .you can now get it to your door for the next day and get an improvement in your sleeping routine the very same night.